Do you have equity in this, that, and the other thing? Do you also need to organize that information in a fast and effective manner? The Equity Reconciliation Report is the ultimate tool to help you take that liquid equity and make it a bit more solid when filing for taxes or filling out other important documents. The last thing you want is a bad audit because you simply forgot about a few assets that you don’t necessarily see every day. This free document can help you organize it all on a single template and keep that information stored for years to come. Learn how to use this template by following the guide provided below. Begin by clicking the link at the bottom of this page to download your new template. The next thing that you’ll want to do is enter the name of your company (if the template is for your business) at the top of the “Equity Reconciliation” tab of the template. This tab is where you will enter all your information. While the document comes with some pretty good examples, you’ll want to make it your own by changing them to your own equity items. 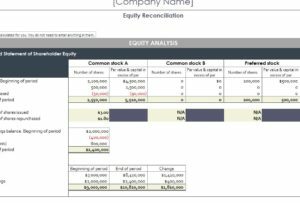 The Equity Reconciliation template will give you the different stock options that you will use as your category pages. Go ahead and change these by clicking on the cell you need to edit and enter something new instead. You can then change the amounts listed in the boxes below to fit your own equity items as well. The template will display the totals for each section, as well as the total amount of stock or other equity that you have entered so far. You can also see the changes in your equity’s value over time in the bottom 3 tables at the very end. When you’re ready to see the overall trends of your equity, go to the “Total Equity” tab. This is just a simple graph that displays all the information you entered in the previous tab in one visual trending chart. You can then use this information to make changes in your equity in the future.